Welcome to Madison the City! We invite you to experience and share our hometown spirit. 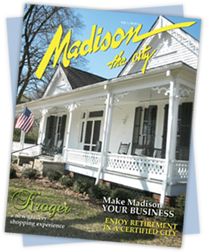 A once small farming community, Madison is now your passport to the best the world has to offer! "This is Madison contains great features in community, education, development and government information around Madison. Pick up your copy today around town. 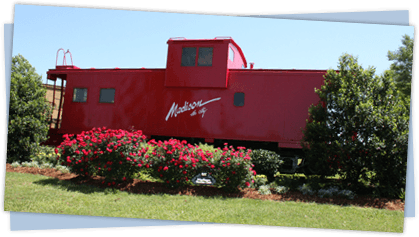 Get ready to Swing into Summer Thursdays in May by the Red Caboose on Main Street. There will be fun for the entire family May 2,9,16 and 23, 6-8 p.m. with music, children's activities and more. Due to severe weather moving into the area, the Bibletones concert for tonight (April 18) at 5 p.m. has been cancelled. Madison's Summer Arts Camp will present "Getting to Know...Footloose" this summer at Madison Square Center for the Arts. Camp runs July 8-19, 9 a.m. to 5 p.m., and the big show is July 20. Join the fun at the the Easter Egg Hunt at Strawberry Patch Park on Saturday, April 13, 9:30-11:30 a.m. The hunt, open to children through age 8, begins promptly at 10 a.m.